Riot Fest Denver may need a new home. Apparently, some feel that the fest will just be too much for Byers, Colorado. A recent Consequence of Sound article shed light on the uncertain situation of this year’s Riot Fest. Originally set to take place in Byers, Colorado at the May Farms venue, the festival could find itself in another city. County officials expressed doubts about the small community of Byers in regard to handling the roughly 17,000 expected to show up to this year’s Riot Fest. Citing the Denver Post, Consequence of Sound revealed that Araphoe County (where Byers is located) has denied Riot Fest the temporary-use permit it needs to commence with planned events at May Farms. The festival’s organizers have yet to appeal the denial of the permit, and this could mean that another location may be needed. 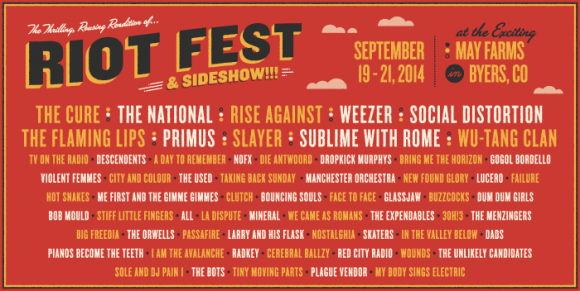 Regardless of where it happens, however, expect Riot Fest 2014 to be well worth the wait.